Blazing stars (Mentzelia species) can be tricky to identify. There are over 70 species, some not well-described in the literature, at least not in the readily-available literature. 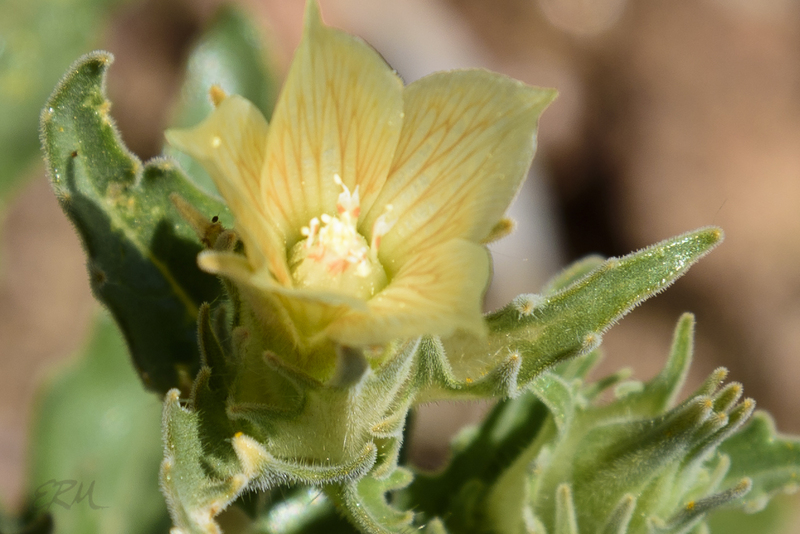 Mentzelia involucrata is easy enough, though, since it’s rather showy and common. Even so, I second-guessed myself with some of the pictures. There’s a similar-looking, M. hirsutissima, which I thought I’d seen. But it’s a rare species, and you know what they say about extraordinary claims. I was able to eliminate that possibility once I read that only M. involucrata has floral bracts that are white with green edges. M. involucrata is an annual plant growing to a little over a foot tall in both the Sonoran and Mojave deserts. There were a few other small, yellow flowers that weren’t so easy, though. I could place them in the Loasaceae by observing the leaves, the flower shape, and the number of petals and stamens. 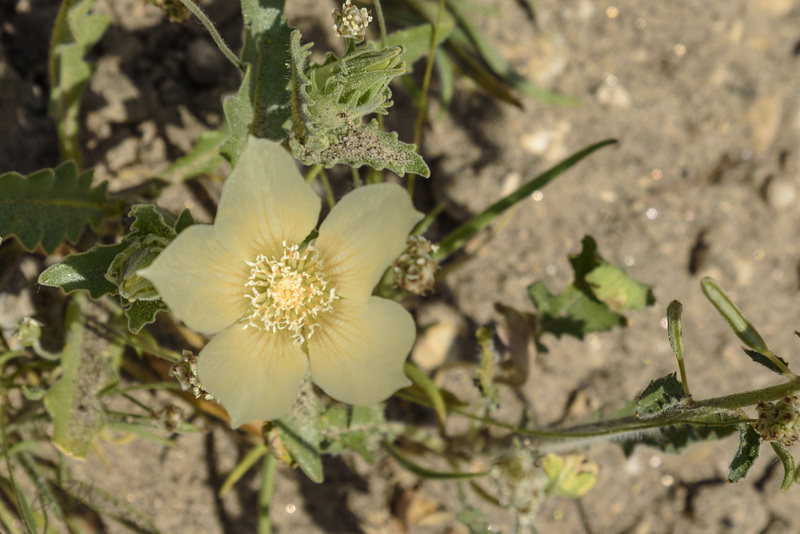 Plants in this family tend to be low-growing, with thick, sometimes hairy, lobed or dentate leaves; the flowers have five radially symmetrical petals and many stamens. Once I figured out Loasaceae, getting to Mentzelia was easy, since it’s the only genus represented in the area (according to the comprehensive San Diego County Native Plants). 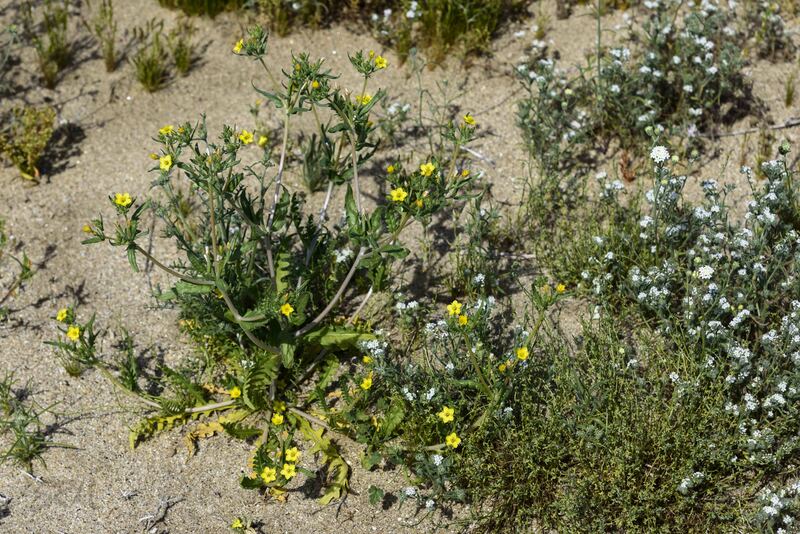 Then it was over to the excellent CalFlora website, which showed 18 Mentzelia species in the Anza-Borrego area. A close look at the location records and habitat information allowed me to eliminate all but four species as possibilities. Detailed descriptions at SEINet led me to eliminate two more, with some uncertainty, leaving two likely candidates: M. affinis (yellowcomet, yellow blazing star) or M. albicaulis (small flowered blazing star, whitestem blazing star). I just don’t have enough of the right details in the pictures to be certain, but after reading various descriptions I’m leaning toward identifying this one as M. affinis. 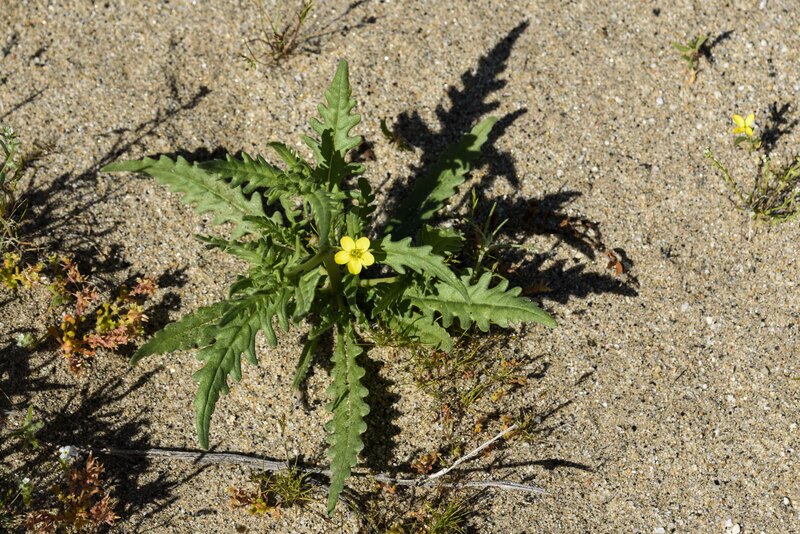 This entry was posted in Uncategorized and tagged Anza-Borrego, Mentzelia, Sonoran Desert by elizabeth. Bookmark the permalink.